My friend was reading this book during our recent trip to New York. I asked to borrow it when we were back in the UK to prolong my NYC buzz and to help wade off any post-holiday blues which surprisingly have not yet struck. I partly put that down to this book. 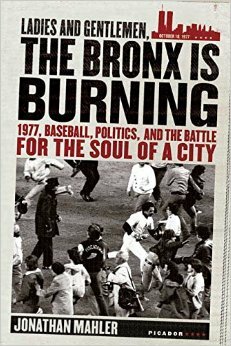 Written by Jonathan Mahler, a New York Times reporter who follows you back on Twitter, it is a remarkably accessible account of New York in 1977 centred around two major themes: the New York Yankees and their topsy turvy season and the savage election battle for the city’s mayoralty. These stories are told through characters so bizarre and fascinating that you repeatedly have to remind myself that they were/are real people, and not merely created for the purpose of the unfolding drama. The most intriguing are the alcoholic Yankees manager, Billy Martin and his team’s rebellious new superstar Reggie Jackson. Being 1970s New York the clashes focus on race, monies and egos, and although one of eventual redemption, it is indeed a rough ride. A basic understanding of baseball may foster greater enjoyment for these parts. However I have essentially none and it remains possible to blag and still enjoy due to Mahler’s brilliant profiling and the sheer wealth of material history provides him. The highlight is a famous bust up in Boston where Martin was visible on national television being physically restrained from attacking Jackson after a costly casual field. Fortunately this remains visible on YouTube. The mayoral election theme is more for political buffs as it centres on the Democratic Party’s machine politics and gives a useful study of the unpleasant intricacies of negative and fearful political campaigns. It also reveals the absolute centrality of race to the city’s recent history and its trauma. Gross fiscal mismanagement, socially crippling unemployment and bitterly opposed new housing projects are all given starring roles in what at times could seem a mere tract on urban decay and the death of a great city. The economic and social depths to which New York stooped to this period, something which Mahler points out was a US-wide perception, and the perspective of the cities recovery since reminds readers that, thankfully, seemingly doomed cities can, and do, recover and that most importantly it is it’s people and their unique characters which drive this. Much like the city itself these main attractions are supported by a wealth of interconnecting side streets brimming with their own wonders. The chapter on the city’s blackout, the subsequent widespread looting and violence and the struggles of the police on that stiflingly hot night of July 13–14, 1977, is a short story worthy of publication in its own right. There is also a chilling section on the serial killer dubbed the “Son of Sam.” The drip-drop narrative of fear taken directly from the city’s newspaper headlines is as perfectly charted as his eventual capture due to bumping a fire hydrant with his Ford Galaxy. There is also a hilarious moment when the incumbent Mayor mistakes the handcuffed killer for the detective who had caught him, amidst the scrum leading him to custody, in front of a media which was more than happy to continue making their crust off of this killer. At many times during reading I thought that these stories sound perfect for TV, so I’m delighted to have just discovered there is an ESPN miniseries based on the book. I’m off to find that now.